Your pets held down the fort all day, so go on! They deserve it! Our full menu of conditioning and medicating bath concoctions offers whatever your pet needs - to treat a problem or to show off to the rest of the pack! Get the best style and cut from our certified groomers who are graduates of the Great Lakes Academy in Homer Glen, they'll restore that best-in-breed glossiness. We strive for a quality-not-quantity approach to pet grooming! We make sure your pet looks their best! All you need to do is get them to dial the phone. If you live in Crest Hill or the surrounding area and need a trusted groomer who cares about your pets – look no further. Strictly Fur Paws Pet Grooming has been serving pets since 2006. All the groomers our fully certified in the grooming arts and pet CPR. They also groom all breeds of cats and dogs...they love them all and do not discriminate against breeds! 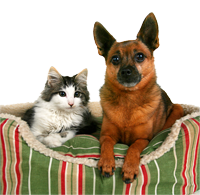 At Strictly Fur Paws Pet Grooming, we treat your pets like the valued family members they are. We also try to not keep them for a long period of time too. Which eliminates stress and bathroom accidents. Depending on the time of your appointment we usually only keep them 2 to 4 hrs. "Our first visit to Amy and the staff at Strictly Fur Paws and I'm hooked! My dogs went in looking like rag-a-muffins and came out looking like brand new dogs! I'm so pleased and have found a new groomer for my girls!"